About Us - Jacksonville Plumber | St Augustine Plumber | Turner Plumbing Co. Experience and training make the difference. The Turner Team has over 150 YEARS combined experience with Turner Plumbing and over 200 YEARS of experience in the industry. 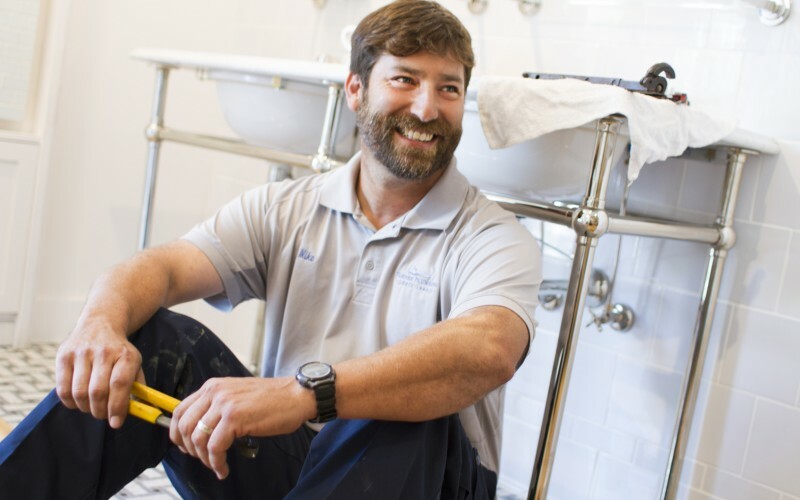 Our men use industry-leading technology to provide you with the most effective solutions to your plumbing needs. We take pride in our work as a 3rd generation plumbing company, and strive to provide excellence to our customers. Turner Plumbing was the dream of Louise C. Turner in the late 1930’s. Following the Great Depression her husband Charles Hollingsworth Turner (Holly) was working as a plumber under a tyrant boss. Louise dreamt of Charles running his own company and set that dream in motion. Louise knew there was a van being auctioned off in Downtown Jacksonville so she grabbed all of their cash. Before the auction began the auctioneer asked those who had cash to raise their hands. Louise proudly raised her hand in the back of the crowd. She was the only one who had shown up with cash. They asked her how much she was willing to pay for the truck and the truck was sold before the auction even began. She rushed to her son’s school to pick up Charles Hollingsworth Turner (Worth); with paint buckets and brushes in the garage she told Worth to paint Turner Plumbing on the side of the truck. When Holly returned home that evening she turned the keys over and told him he had his own company. Holly was able to grow the company to a few employees with Louise running the office operations and keeping the books. After Holly’s passing, Worth Turner set aside his studies at the University of Alabama and returned home to keep the company alive. Turner Plumbing’s growth continued on the solid foundation Louise and Holly had instilled of honest and loyal service. Worth worked tirelessly for many years and passed the expert plumbing teachings of his father onto his son Buz Turner. Buz is the current owner and operator of the company. He is joined in the business by his wife Carla who handles office logistics, financials and specializes in general contracting, his sister Deborah who has been with Turner Plumbing since the 1980’s doing everything from office management to showroom sales, his son Worth Turner who has taken over Hollingsworth Showroom as Owner and designer, and his daughter Kendal who works along side Buz and Carla in organizing bathroom remodels. Aside from his immediate family involved in Turner Plumbing, team members that feel like family accompany Buz. Over 72 years later, Turner plumbing has flourished in Northeast Florida due to the support of our customers and our talented team. We are bonded, insured, maintain a state contractors license and are run by master plumbers and journeymen. Our technicians are drug-tested upon hiring and randomly throughout the year. Our trucks are clearly marked with the Turner Plumbing logo. Our team does not work on commission. We feel by not offering commission-based compensation, a customer has an additional layer of trust when it comes to recommendations made by the plumber on needed work and materials. We are committed to hiring and training talented and personable team members in order to continue to provide white-glove service to our clients.